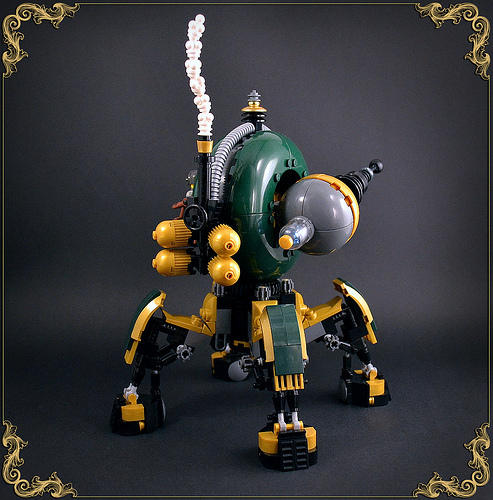 Captain Smog is one of my favourite steampunk builders. 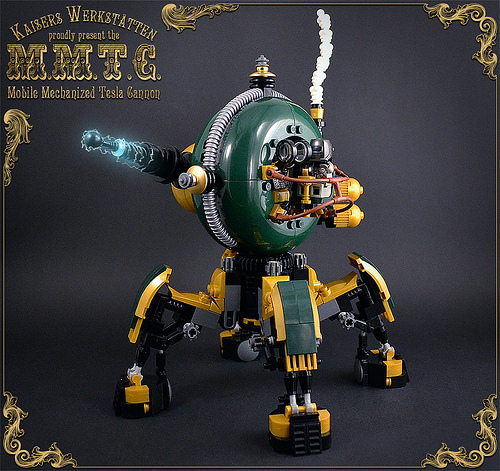 His models always provide classy and colorful relief from the endless sea of brown and grey creations which can sometimes fill up the LEGO Steampunk Group on Flickr. I’ve been guilty of “brownification” myself in past clanky creations, but I’m now firmly of the opinion we steampunk builders should get our act together and start using some of our more colorful bricks more often. Anyway, enough ranting and back to this model. It’s a cracker, a lurching mechanical beast of an electrical cannon, WITH A LOVELY COLOR SCHEME THAT IS NOT MOSTLY BROWN. Beyond the colors, the building techniques on show here are excellent. The legs of the beastie look wonderfully functional, particularly the cog hips at the base of the chassis, which you can imagine allowing the cannon to track moving targets across the battlefield. 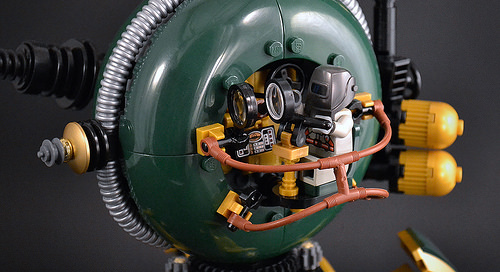 The side-mounted cockpit is a nice touch, and I’m loving the pilot in his protective mask peering through a dual magnifying glass sight. All-in-all, this is quite splendid. Well played Captain Smog! I doff my top hat in your general direction.